Discover how abandoned railway lines have been ingeniously used to create a “Rail Trail,” in New Hampshire. When traveling in New Hampshire, it’s easy to check a road map, follow MapQuest, listen to a GPS, or just drive around and find your way. Or, if you want to set out on your bike or your feet, you can follow a “Rail Trail” over a path laid by the Northern Railroad before the Civil War. The Northern Rail Trail runs from Lebanon to Grafton for 23 miles, heading southeast towards Concord. Another section continues from Andover to Franklin along US Route 4. Plans to rehabilitate the section between Grafton and Andover are underway which will provide a continuous route. The Friends of the Northern Rail Trail have a Facebook site with maps and photos, open to all users. The group is a conduit for trail information, events and places to stay along the path. 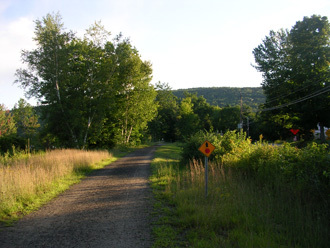 Rail Trails have been formed around New Hampshire on old train beds, giving a new use to a lost mode of transportation. In the mid-nineties, the state took over the lines and the Northern Rail Trail was born. It begins in Lebanon about a block from the city’s central green, Colburn Park. From there the trail follows the Mascoma River southeasterly to the shores of Mascoma Lake. It passes through downtown Enfield, past the former train depot used a hundred years ago by the Shakers in the Enfield colony to ship their goods, the trail again follows the Mascoma River towards Canaan and on to Grafton. The bed surface varies, from hard pack to gravel to mulch, with the bridges, some old and some new, over roads and river crossings. With its proximity to the river, one can use the rail trail for portage of canoes and kayaks, even going longer distances with boat wheels. From 1847, passenger and freight services ran on these lines between White River Jct., Vermont and Concord, New Hampshire. Boston & Maine railroad took over the line, extending their service from Boston to Canada. Its need eventually dwindled with passenger service ending in the sixties, freight in the seventies. While the rail beds were the path of least resistance for travel - fairly straight and quite flat - the improved highway systems in New Hampshire made them obsolete. The rails remained intact, however, and the B&M line ran trains in 1982 when another line following the Connecticut River in Vermont was blocked by a derailment. This last run marked the end of train travel on the Northern Rail Line. After more than a decade of sitting idle, the State of New Hampshire acquired the Northern Rail Line with trails in mind. 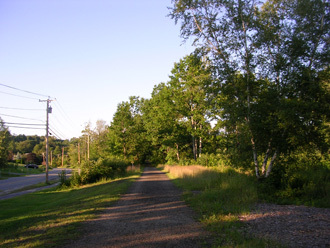 Managed by local groups and the NH Bureau of Trails, the lines are now prime walking, jogging and biking terrain for those going the distance on a flat surface. More projects are in the works to expand travel. 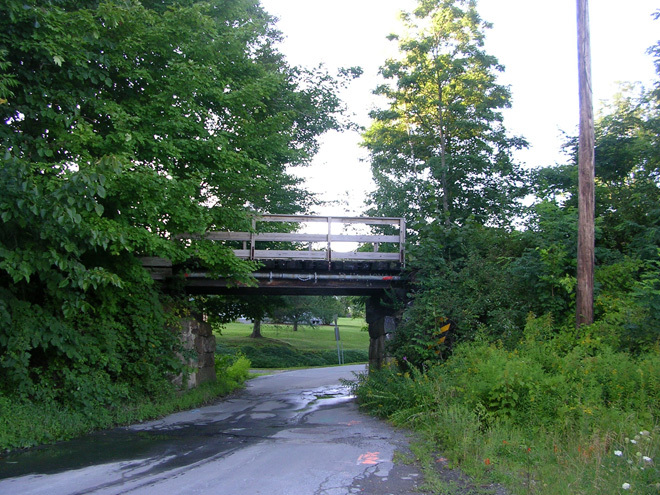 Traveling by Rail Trail has become popular in New Hampshire for its even terrain and safety from road traffic. Whether you walk, run, bike, or convey yourself in any other non-motorized fashion, you can enjoy the scenery and travel the trails cut 160 years ago to get from town to town.